Keith Williams Architects’ residential led project on Rye Lane, Peckham for developer Reality Holdings, has been unanimously approved by Southwark Council’s planning sub-committee. Set within the Rye Lane Conservation Area, the new building transitions in scale from the two storey C19th housing on Highshore Road, to a height of six storeys as the building faces onto Rye Lane itself, at a scale similar to some of the grander former department stores and bank buildings, a number of which still punctuate the street scene. 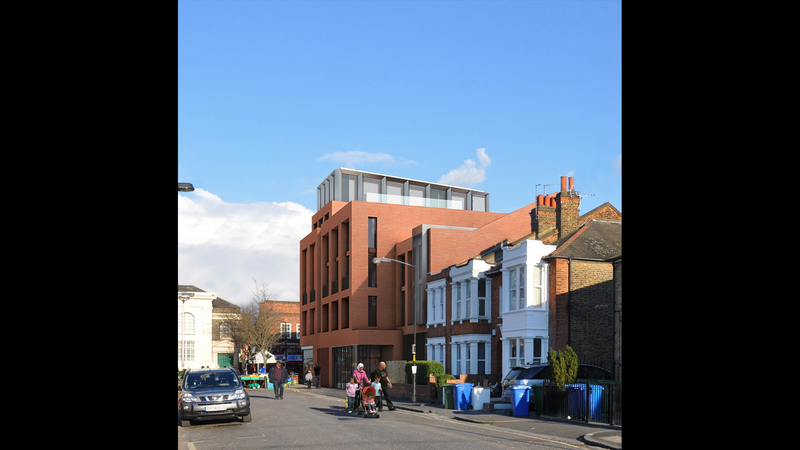 The double height columnar treatment to the main façade gives a vertical more elegant emphasis to the composition, and whilst the main Rye Lane façade is continuous to give a civic scale to the main street, the same elevational rhythm is further subdivided before dropping in scale to respond to finer architectural grain of Highshore Road. Facing materials include red brick surmounted by polished aluminium cladding to the sixth storey rooftop pavilion.